If you enjoy playing games where you can run, jump and go on adventures games that will get you addicted to playing fast and keep your attention each time you play then you should know how to choose the best game for this purpose. For all of you that have problems choosing this kind of game, we did our research and we discovered one addictive and exciting adventure running game where you can run and jump, trying to escape creatures. Let’s discuss it. Developed for Android users as one easy to play and fun for both adults and kids this is an exciting and addictive adventure running game that offers every player to enjoy running against ugly and weird creatures with his amazing and cool robot character. Players will enjoy the catchy and immerse music when they are playing and the beautiful HD graphics with the most simple and user-friendly interface. Using the on-screen controls, the player will run and jump, trying to outrun the creatures and get as far as he can to win his high scores and become the best player of the game. Giant Robot Adventures has to offer all its players endless fun with the most amazing features that will keep their attention each time they run and play. Just with using the on-screen controls the player can move, run and jump with the robot, avoiding all obstacles in his ways and at the same time trying to collect as many stars as possible. The game is also offering the users the ability for them to double jump and slide when they need it. The players that collect as many stars as possible and try to outrun the creatures, getting as far in the game as they can win the highest scores. The scores of each player can be seen in the game’s center because there is the leader-board and the players can compete with each other, see who is on top of it and try to become the ultimate player by getting the highest scores as possible. Players will certainly have fun and enjoy the exciting and fun gameplay, competing and winning high scores. 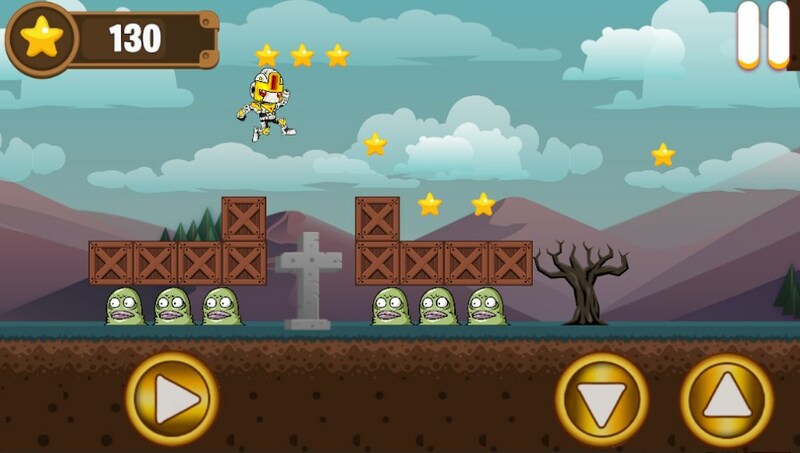 Download the game on Google Play for free now to outrun the creatures and collect all stars!